BOSTON — A team at the Wyss Institute for Biologically Inspired Engineering at Harvard University has been awarded a special $3.5 million grant from the National Institutes of Health (NIH) to develop an inexpensive and easy-to-use new microscopy method to simultaneously spot many tiny components of cells. The grant, called a Transformative Research Award, is part of an NIH initiative to fund high-risk, high-reward research, and in 2013 the agency funded just 10 of these projects nationally. The DNA-based microscopy method could potentially lead to new ways of diagnosing disease by distinguishing healthy and diseased cells based on sophisticated molecular details. It could also help scientists uncover how the cell’s components carry out their work inside the cell. “If you want to study physiology and disease, you want to see how the molecules work, and it’s important to see them in their native environments,” said Peng Yin, Ph.D., a core faculty member at the Wyss Institute and Assistant Professor of Systems Biology at Harvard Medical School. Yin will lead the project, and he will collaborate with Samie Jaffrey, M.D., Ph.D., a Professor of Pharmacology at Weill Cornell Medical College, and Ralf Jungmann, Ph.D., a postdoctoral scholar in Yin’s Wyss Institute lab, among others. Wyss Institute scientists have begun programming DNA to help make specific targets in the cell blink. This leads to sharp images of cellular parts that are typically too small to see in a light microscope. Biologists have used microscopes to reveal how tiny structures inside cells prop them up and help them move, reproduce, activate genes, and much more. But although microscope makers have honed the technology for centuries to get ever-clearer images, they have been limited by the laws of physics. When two objects are closer than about 0.2 micrometers, or about one five-hundredth the width of a human hair, the scientists can no longer distinguish them using traditional light microscopes. As a result, the viewer sees one blurry blob where in reality there are two objects. This behavior occurs because of the way light rays bend around objects, and is known as the diffraction limit. Molecules such as enzymes, receptors, RNA and DNA that do most of the work of the cell are typically far smaller than 0.2 micrometers, and to visualize them microscopists have struggled to overcome this limitation. They have developed several clever methods that accomplish this, but some of them require special microscopes that tend to be very expensive, and others require cumbersome procedures. What’s more, today’s methods can only reveal a handful of distinct molecule species at a time, and the images remain blurrier than many scientists would like. The Wyss Institute-led team plans to overcome these challenges by combining single-molecule imaging methods with molecular tools from DNA nanotechnology. Using an imaging method called DNA-PAINT, they created so-called “imager strands” by tagging small pieces of DNA with a fluorescent dye. 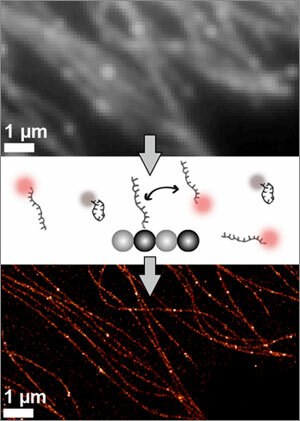 Each of these imager strands binds transiently to a matching DNA strand that is attached to a target molecule, which makes the target appear to blink. Such blinking, when done right, enables scientists to beat the diffraction limit and obtain sharper images of the targets than otherwise possible. Yin’s team specializes in using DNA to make programmable synthetic nanostructures. Two weeks ago, the National Science Foundation awarded the team and their colleagues a prestigious Expedition in Computing Award Expedition in Computing Award to engineer synthetic DNA systems with programmable molecular behavior and functions. The NIH Transformative Research Award will allow them to use DNA to program blinking light to produce ultrasharp molecular and cellular images for biomedical research.